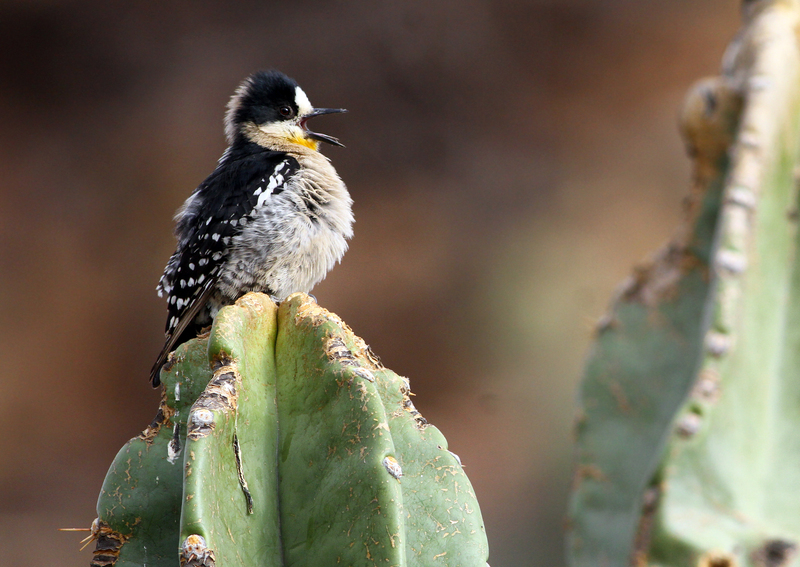 White-fronted Woodpecker in Bolivia. Copyright Andrew Spencer. As a young scientist in my twenties, I remember when I first became aware of the idea of plumage mimicry in birds. I was sitting in the kitchen of a research station in eastern Ecuador, studying the field guide, when I opened to plate 73 of Ridgely and Greenfield’s The Birds of Ecuador. Six species jumped out at me—three pairs of very-similar suboscine passerines. I’d just come from working for a few months in western Ecuador, where I’d learned to distinguish the similar looking Rufous Piha, Rufous Mourner, and Speckled Mourner from one another. I knew that despite the similar English names, these three birds are distantly related to one another, each classified in its own genus. I realized that here, on the other side of the Andes, there was a different species of each of these same three genera—the Screaming Piha, Grayish Mourner, and Cinereous Mourner—but that here in the Amazon they were all gray, not rufous. Coincidence? Probably not, and here's why. Imagine a rainbow-colored roulette wheel. Imagine if someone told you they were going to place six bets, and that the first three would land on rufous, and the second three would land on gray. Fat chance, right? I'd take that bet. So, how had these birds independently converged on rufous in one region, and gray in another? The roulette wheel of mourners and pihas must have been loaded. The easiest way to load the roulette wheel of plumage evolution is if environments favor different colors, but that didn't seem possible for this case. The forests generally looked similar—full of green leaves, vines, and brown tree trunks. The climates were generally similar—warm and wet. What was the selective pressure driving this process? Fascinated, I started digging deeper. I came to realize there were other notable purported mimicry complexes, including toucans and woodpeckers—patterns flagged by some of our ornithological forebears like Alfred Russel Wallace. I chatted about the idea with Dr. Greg Grether, who alerted me to a series of papers published in the 1960s and 1970s on the subject. They were exciting to read, but I didn’t find them compelling; I was having trouble believing the proposed mechanisms would drive the observed patterns. For example, Cody (1969) postulated that interspecific territoriality would be facilitated by looking like your neighbors, but Downy and Hairy Woodpeckers do not appear to be interspecifically territorial; Murray (1976) speculated that it was convergence favored by shared environments, something that seemed unlikely for reasons discussed above. I was sure the roulette wheel was loaded, I just wasn’t sure in what way—it had to be something other than what these folks had suggested in the 60s and 70s. I flirted with the idea of focusing my dissertation on this research question, but ultimately decided I didn’t have any bright ideas to offer to the discussion. Ten years later, I became aware of a compelling paper on the subject by Prum and Samuelson (2012). It was a few years old already, but I’d missed it when it came out. I loved this paper because it got me thinking about plumage mimicry again, and because it offered a novel hypothesis for how these supposed mimicry complexes arise. The authors called the new hypothesis interspecific social dominance mimicry (ISDM). But I was equally unconvinced about the proposed mechanism. It relied on socially subordinate species like Downy Woodpeckers fooling socially dominant species like Hairy Woodpeckers—I regularly watch these species interact in the forest, and they didn’t seem confused about identities. I said as much to a colleague (Gavin Leighton), and he suggested that a project we’d recently gotten off the ground might provide the raw data to test the ISDM hypothesis. Right away we saw this as two separate but related questions. Can the seemingly dramatic convergences in plumage in various purported avian mimics be explained by shared evolutionary history, climate, or habitat use, or do these convergences truly seem to involve social interactions? And, could we find any evidence that ISDM was operating in birds? Given the data at hand, the obvious choice was to dive into the woodpeckers, a choice reinforced by the recent discovery of another remarkable mimicry complex in southern South America. Led by Dr. Leighton, our research group has since published our lack of support for the ISDM hypothesis, and our results have already been discussed in blogs elsewhere (e.g., here and here), so I won’t dwell on the question here. In short, we may have found the way in which the roulette wheel is loaded. 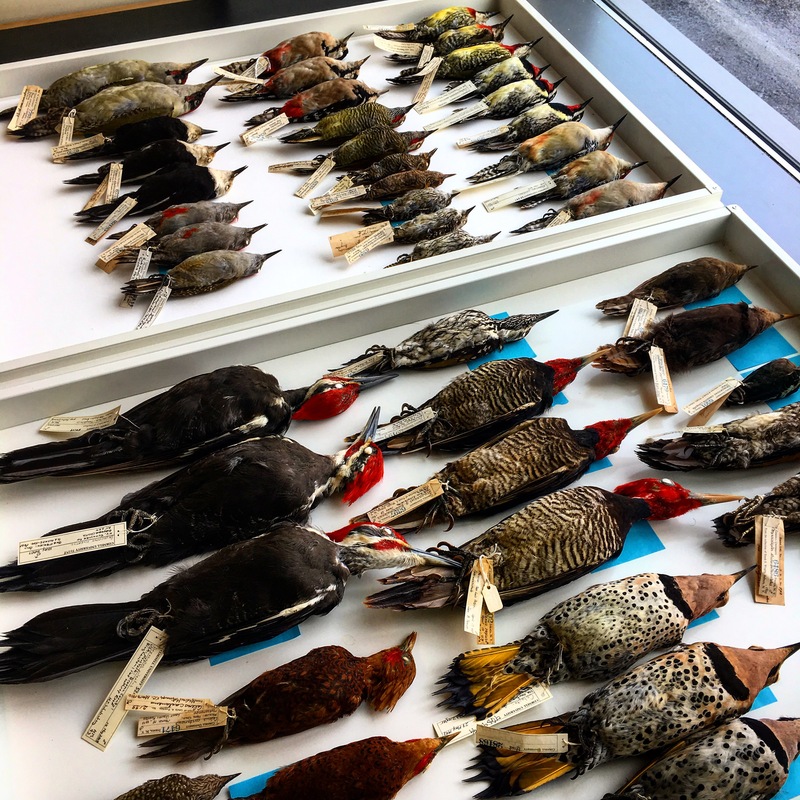 To address the first question—the subject of our current paper at Nature Communications—we joined forces with a few other colleagues, and we expanded our focus from two woodpeckers to all woodpeckers globally. We employed a number of techniques and investigated a number of potential biases (picture from museum) in the hope of decisively addressing whether these apparent plumage convergence events can be explained by other factors, or whether they truly appear to be some sort of social mimicry. Given some of the impressive avian plumage mimics that have been qualitatively identified, including the gray- and rufous-colored mourners and pihas mentioned at the start of this post, we were pleased to find strong statistical support that woodpeckers engage in mimicry complexes across the globe. Plumage convergence just can’t be explained by shared evolutionary history, or shared climate space or habitat use. The roulette wheel is definitely loaded by selective pressures of some sort, and these pressures have driven woodpeckers to converge in plumage pattern beyond what can be explained by shared environment. We eagerly await corroboration of these patterns in other avian groups, and of further investigation into the mechanism(s) that drive these mimicry patterns. Crimson-crested Woodpecker poster photo copyright: Drew Weber, from Macaulay Library.